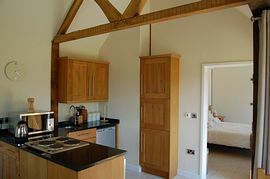 Oak Lodge is a new high quality development situated on the edge of the Goodwood Estate, 2 miles east of Chichester. 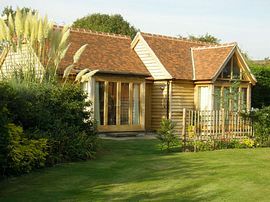 The Lodge has been built in the grounds of Oak House and offers lovely views of the owner's garden and open fields across to Chichester Cathedral. Goodwood hotel and leisure club is a few minutes stroll from the property, down a one-way country lane. (Restaurants open to non-members or non - hotel guests). The Kennels is less than 3 minutes drive away. Oak Lodge is single storey, constructed of solid oak internally and externally, with open roof space and exposed oak beams. The total floor area is 270 sq. ft. comprising open plan living/kitchen area and bedroom en-suite. Both rooms have full-length patio doors opening on to the south facing patio. En-suite shower room accessed by bedroom only. Please note special rates may apply during main Goodwood events during July - September. 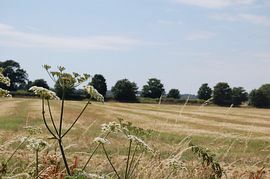 The property is within walking distance of the Revival and Festival of Speed sites and 8 minutes drive from Goodwood Racecourse. Close to all the Goodwood facilities. Only 2 miles out of City centre but in countryside. From Lavant first left after sign to Goodwood Park Hotel. The lodge is next to thatched cottage on right. Tariff from Jan 10 (inclusive of linen, towels, toiletries and electricity). From £375 per week for up to 3 people. Please see owners website for tariff details.